A Fembot living in a Manbot’s Manputer’s world. Little-known fact: The first computer programmers were all women. 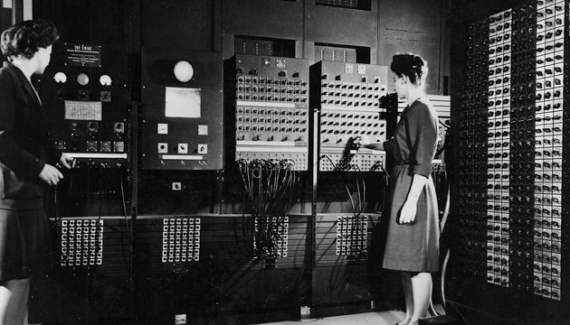 ENIAC was programmed by Jean Bartik, Marlyn Meltzer, Kathleen Mauchly Antonelli, Betty Snyder Holberton, Ruth Lichterman Teitelbaum, and Frances Bilas Spence. Bartik and her colleagues debugged every vacuum tube and learned how to make it work, she said. Early on, they demonstrated to the military brass how the computer worked, with the programmers setting the process into motion and showing how it produced an answer. They handed out its punch cards as souvenirs. They’d taught the massive machine do math that would’ve taken hours by hand. what is this thing you humans call... love? Littler-known fact: Many of the first computers were also women! In the days before ENIAC, ‘computer’ was a job, not a machine, and thousands of women were recruited by the US Military to do ballistics research to supply weapons trajectories to soldiers and bombardiers. Top Secret Rosies, a documentary about WWII’s female computers, was released last month. Erickson’s documentary focused on women plucked from high schools and colleges to work at the University of Pennsylvania in the 1940s. They moved into dorms and apartments and went through a rigorous introduction to ballistics calculations in order to do the job. It paid well, and the women were close. They played bridge, shared dinners and danced together in the university gardens when the war in Europe ended.